Joceyln Black, Dana Welch and Sandra Moffatt of Tourism Ireland. Tourism Ireland continues to work closely with agents as it grows its visitation from Canada, officials say. Speaking to TravelPulse Canada at a Tourism Ireland pre-Halloween event in Toronto (more on that later), Tourism Ireland’s marketing manager Dana Welch said Canadian numbers for 2018 aren’t in but that North American visits are up by double digit margins so far this year. “Canada is a top 10 market globally but we’re fifth in revenue,” she said at a lively session at the Dora Keogh pub in Toronto, where they had wonderful storytelling, great food, whiskey samples and a terrific band. Sandra Moffatt, the trade promotions and digital marketing executive for Tourism Ireland in Canada, said they put on regular webinars for agents and have a website with tons of video and photos that agents can use. The site can be accessed at www.irelandscontentpool.com. What's a Tourism Ireland event without some music? The band at the Dora Keogh pub in Toronto was terrific. They also have an Ireland specialist program, where agents can be trained in Ireland’s wide offerings. They just had a fam trip for agents this month but will do another one next fall. And they do regular sales missions twice a year. Welch said the number of new flights being added to Ireland from Canada bodes well for future growth. Norwegian Air is supposed to add flights to Dublin from Hamilton, Ontario next March, while WestJet will begin Calgary-Dublin flights next June and Aer Lingus will add Montreal-Dublin flights next August or perhaps a little later. Those flights are in addition to routes that already exist from Toronto, Vancouver and St. John’s, she said. Big events on the horizon include the British Open golf tournament, slated for Royal Portrush in Northern Ireland next summer, Welch said. 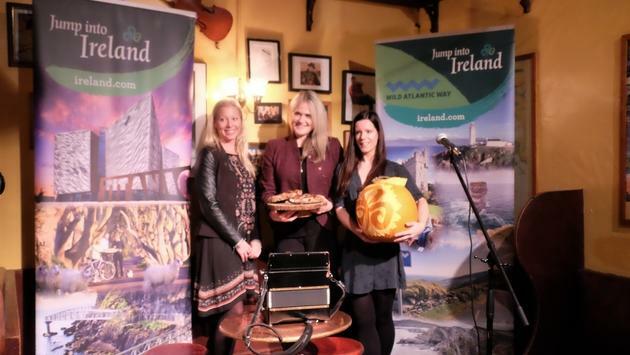 The Tourism Ireland event was held in late October to help publicize the fact that Halloween originated in Ireland, where it was an ancient Celtic festival featuring folks in costume to ward off evil spirits. Apparently, they used to carve turnips, which seems like a much bigger challenge than cutting a face into a large pumpkin; a trend that apparently began in North America much later. 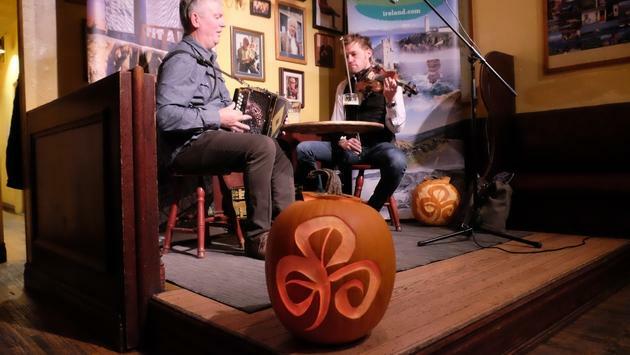 Johnny Lynn tells a spooky pre-Halloween story at a Tourism Ireland event in Toronto. There was a tremendous show put on by a pair of local musicians who play the Dora Keogh most Thursday nights. 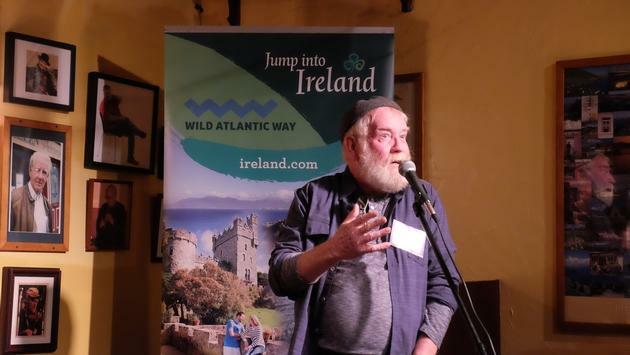 Tourism Ireland also had storyteller Johnny Lynn weave his magic with a series of great stories about Ireland and the various facial and hand motions one uses at an average night at the pub. It doesn’t sound like much, but, believe me, it was magical. 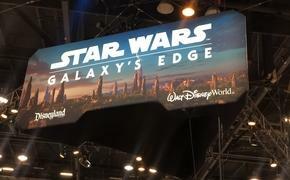 And funny as hell. Click here for his telling of the story of an Irishman who got to return to the green pastures of home after years living in the Alberta prairies. Guests also got to try some Irish Whiskey; a blend called Quiet Man and a 10-year-old from the famous Temple Bar in Ireland; a product I was told they stock at the LCBO in Ontario, and thank you for that.